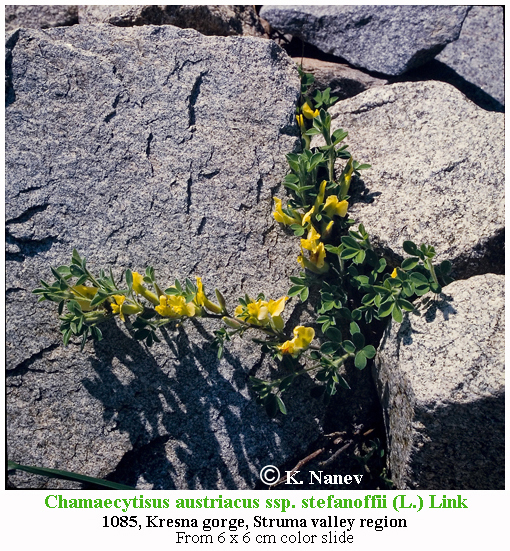 Chamaecytisus austriacus (L.) Link is a synonym of Cytisus austriacus L.
This name is a synonym of Cytisus austriacus L.. The record derives from ILDIS (data supplied on 2010-07-14) which reports it as a synonym (record 8712 [mirror]). This name was in version 1 of The Plant List, record ild-8712. 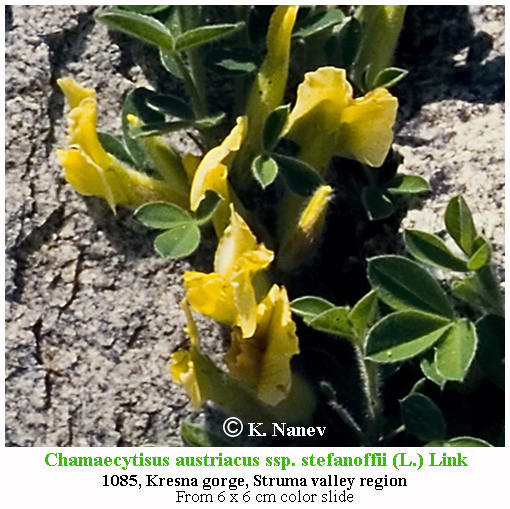 Species: Chamaecytisus austriacus (L.) Link. Wood .. Bush. Stem 15.0 - 70.0 cm tall, branched from the base, woodened, scattered fiber or naked, round, bark dark gray to brown cracky. Branches erect, creeping or ascending. Shoots 10.0 - 20.0 cm long, 1.0 - 2.0 mm in diameter, densely silky short to long rough fitting to the upstream fiber. Leaves triple; axis (3.0) 5.0 - 10.0 mm long, fitting densely hairy. Leaflets (5 - 10) 15.0 - 25.0 mm long and 3.0 - 6.0 mm wide, elongated ovoid back, narrowly elliptical to elliptical lance, at the base wedge narrowed in short, to 1.0 mm long, off-standing densely fibrous little stems, on top wedge-like or blunt, short gabled top, entire, above a dark green, thick scattered to short-fitting fibrous rarely bare, bottom, gray-green to silvery, densely short off-standing silky fiber. Flowers 5 - 15 in racemes of head enveloped the above Stem leaves at the tips of branches, often in the outer clusters along the stem, side inflorescences. Flower stems 2.0 - 5.0 mm long, densely-fitting short or long silky fiber rough fibrous, in the upper half 1 (2 - 3) lanceolate to linear textured petals. Calyx from 10.0 - 12.0 mm in length and 4.0 - 5.0 mm wide, with thick, more or less spread out rarely and lies close cloth 1/3 bilabial, upper lip 1/3 two-pronged, teeth broadly triangular, lower shallow drills, teeth styliform. Corolla 15.0 - 22.0 mm long. Flag 6.0 - 9.0 mm wide, elliptical ovoid back, on top of all or shallow incised, in the bottom third gradually narrowed into a long claw wide, slightly longer than the wings and keel, intense yellow, on the back to close at low silk cloth. Wings extended elliptic to ovate elliptical back, at the base with long thin nails; slightly longer than the keel, intense yellow, naked. The keel elliptical, slightly curved sickle, basically thin long nails, intense yellow, naked, on the edge cilia. Beans 2.0 - 3.0 cm long and 5.0 mm wide, oblong, the top short-elongated, flattened, narrowly elliptical cross section, the surfaces and thick seams fitting silk fiber, 3 - 5-seed. Seeds 2.8 - 3.0 mm long and 2.5 mm wide, lenticular ovate, green brown to tan, smooth. subsp. austriacus. The branches with short silk cloth. Calyx with short outstretched cloth. Black Sea Coast (Northern), Northeastern Bulgaria, the Danube plain, Fore, Central Stara Planina region Znepolski region, Vitosha Region, West Central forest, Rodopi mountains. var. austriacus. Top leaflets more or less densely pubescent. Black Sea Coast (Northern), Northeastern Bulgaria, the Danube plain, Fore, Central Stara Planina region Znepole region, (Stankedimitrovsko), Vitosha Region, West Central forest, Rhodope mountains . Indicate for: Belasitza (Stoian., 1920). var virescens (Kovats) Kuzm., comb, n .; Cytisus austriacus var, virescens Kovats apud. Neilr., FL Wien (1846) 640. Top leaflets absently fibrous or naked. Central Stara Planina (Balkan) - Karlovo region), Znepole region (Rudina Mountain Stankedimitrovsko) Fore (Lovech). subsp. stefanoffii (Stoj.) Kuzm., comb, et st. n .; Cytisus austriacus var. stefanoffii Stoj ,, Izvestia. Bul. Bot. Society. V (1932) 102; Cytisus austriacus var. urumovii Stoj., 1. c. The branches with close at long coarse hairs upward. Calyx with long spreading hairs. Znepole region, Struma valley Fore, Rila (Samokov, Stanke Dimitrov), West and Central Rhodopes. Note. Forms morphologically similar to typical C. austriacus (with fitting silky coat hairs) are very rare in Bulgaria and are found only in North Bulgaria (mostly Northwestern Bulgaria). They are distinguished from typical along the length and location of hairs on the twigs and the calyx, which generally are longer and not as lies close. Gradually south observed transitions and forms in southern Bulgaria are harsh and long, often ascending hairs on twigs and long hairs in the calyx. The entire complex, united in subsp. stefamoffi is too erratic, but is not currently differentiate individual intraspecific taxa. The species seen in a narrow volume and to it refer only forms with outstretched cloth of the calyx and lies close hairs of branches. Flowering Time: Blooms: VI - VIII. Distribution in Bulgaria: Grow in the bushes and grassy areas in the plains and foothills. Wide spread except West Frontier Mountains, Belasitsa, Slavyanka, Pirin, Thracian Lowland, Tundzha hilly plain, Strandzha, from sea level up to about 1500 m altitude. (Conspectus of the Bulgarian Vascular Flora) = conspectus&gs_l= Zlc.